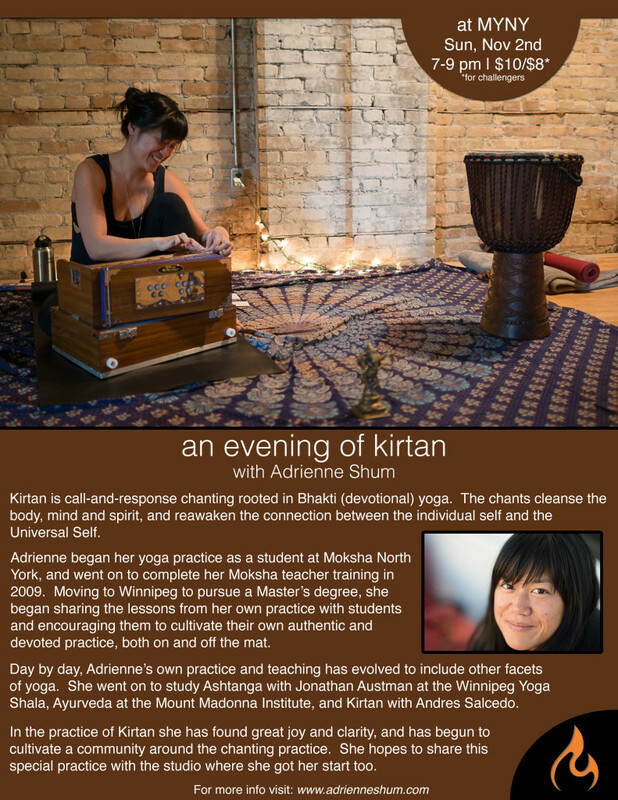 Kirtan at Moksha Yoga North York in Toronto!!! I’m not sure if it’s because I was in school for over 20 years, or if fall is really magical, but September feels more like the beginning of a new year to me than January. I’m really looking forward to delving into practice and sharing that with you as the weather cools. The weekend vipassana retreat on October 3-5 with Jonathan Austman is full already, but there is still space in the Ayurvedic Diet Cleanse Workshop at Yoga Public on October 19th, 2-4 pm! A change in seasons is a great time to reset, let go of the past, and make space for what is around the corner. I hope you can join me! A change in seasons is the best time to cleanse the body: when the environment is in a state of transition, it encourages similar transformation within ourselves. 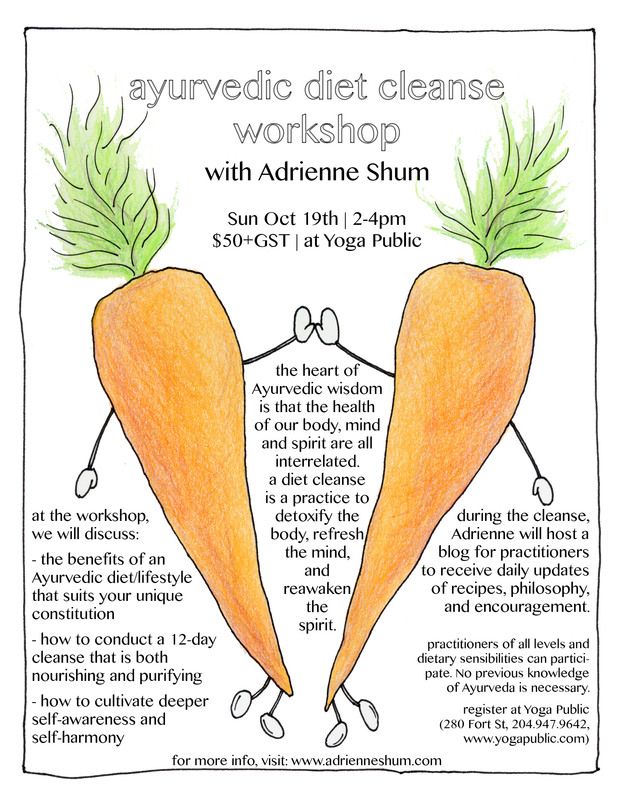 This fall, the Ayurvedic Diet Cleanse Workshop will be on October 19th, 2-4 pm, at Yoga Public (Winnipeg, MB, Canada). During the workshop, we will ground ourselves in studying the fundamental principles of Ayurveda, set our intentions for doing a 12-day cleanse and discuss its parameters. Taking simple but nourishing foods gives the body time to detoxify and re-establish a state of harmony and stability. During the cleanse, participants will have access to a private blog hosted by Adrienne which will have daily updates of recipes, philosophy and encouragement. This cleansing practice is an opportunity to purify the body, clarify the mind, and reawaken the spirit! No previous knowledge of Ayurveda is required to participate, and students of all dietary persuasions are welcome (specific concerns can be discussed privately with Adrienne). Registration for this workshop can be completed online at www.yogapublic.com or by visiting the studio (280 Fort St, 204.947.9642). Please consider registering early; this workshop tends to sell out.